Breeders are listed by farm name. Breeders with no farm name are listed by owner name. Click a letter below to jump down the page. For a list of breeders by breed, click a link in the key below. The Yorkshire breed is known as the “Mother Breed” because Yorkshire sows characteristically farrow and raise large litters of pigs. Yorkshires are large-framed hogs, particularly in length, which allows them to be marketed at heavier weights without loss of efficiency. The Yorkshire barrows, in years of National Barrow Show records, average more than 32 inches in the carcass contest, consistently longer than any other breed and even longer than crossbreds. A five-year boar test station average of Yorkshire boars when taken to 240 pounds, gained an average of 2.07 per day with feed efficiency of 2.55, tops in both categories for all breeds. The red breed of hogs known as Duroc is a major contributor to almost every successful hog operation. This breed has long been known for its ability to grow faster on less feed. The Duroc’s ability to display a rapid growth rate, coinciding with efficient conversion of pound of feed to pounds of red meat, is unequaled by any other breed. Through the use of purebred Duroc boars in commercial operations, the producer can maximize the heterosis that is generated by crossbreeding pure genetic lines. Duroc’s skeletal structure, which stands up in all kinds of environments, combined with natural leanness, produce a fast growing, efficient product that is acceptable to the packer and the consumer. This ensures that the Duroc breed will continue to play an integral part in the production of pork for discriminating Americans. This black animal has a distinct and unique belt, which is a strip of white entirely encircling the body including both front legs and feet. Hampshires are productive, lean, profitable to raise and full of meat. Hampshire boars are aggressive and Hampshire females have gained the reputation in the commercial swine industry as excellent pigs raisers that add longevity to the sow herd. This black animal with the white belt is know universally as “The Mark of a Meat Hog.” Their ability to sire winning carcasses is unequalled and they continue to set the standard, by which all other terminal sires are evaluated. Landrace are superior in maternal performance. University trials reveal them to be a component of 5 of the top 6 F1 breed combinations for litter performance to 21 days of age. Landrace are also at or near the top for number born alive and individual pig weight at weaning. National Barrow Show Progeny Test results show purebred Landrace to rank third for growth rate, trailing the leader by only .1 lb. per day, and to be leanest in last rib and second leanest in 10th rib backfat thickness. They excel all breeds in carcass length. Crossherd genetic evaluation has produced dramatic breed improvement in performance and carcass traits. These changes plus effective selection for smaller ears and strong legs have made Landrace an essential component of successful crossbreeding programs. Poland Chinas offer commercial hog operations increased sow herd longevity and breeding barn performance. The high percent of lean of Polands has long been known to pork producers and is even more important today as more markets are paying for high percent lean carcasses. Poland boars and sows excel in practical, money-making traits important to profitable pork production — natural soundness, a durable, sturdy structure and the ability to adapt to nearly any environment, from pasture huts to total confinement operations. Poland sows stay in durable condition, litter after litter, and perform in the farrowing house in a superior fashion. There’s no doubt about the importance of hardy, durable seedstock in your herd, and the Spotted breed provides just that. Spot boars are rugged as well as aggressive breeders that don’t have to be handled with “kid gloves” to get the job done. 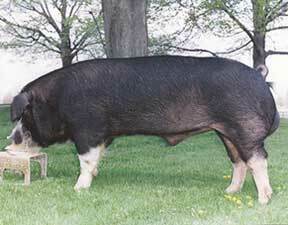 They are simply the kind of sow-settling breeders that can solve conception problems quickly. Reproductive efficiency is also a strong suit of the Spotted female. She’ll raise what she farrows and will maintain her condition doing it. The spot female’s hardy nature is a major influence on the breed’s ability to be a legitimate contributor to gilt pools in commercial operations. The pork producer of today has a vast pool of genetics from which to choose. The Spotted breed is an important part of that pool, particularly when extra reproductive efficiency, hardiness, durability and boar aggressiveness are demanded. The Berkshire breed is the only genetic source in the swine industry that has a value-based premium based on known superior pork quality. Berkshire pork has been scientifically proven to have better color, texture, marbling, ultimate pH, and water holding capacity — all known factors to better eating quality and making pork the meat of choice. Several packers are paying substantial premiums for Berkshire market hogs. A simple management choice — the selection of purebred Berkshire genetics with a properly transferred pedigree will open the door for new profit opportunities that can’t be found anywhere in the entire pork industry. Today’s Berkshires have been bred to be strong in the profit areas — either maternal or as a terminal sire. Berkshire premiums can be realized in any operation — large or small, and represent a great opportunity to keep family farm pork operations viable for the future. As it all starts in the breeding pen, it becomes economically necessary to infuse genetics which provide high conception rates. 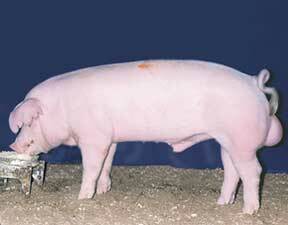 Chester White females have long been known for a high conception rate and a large number of vigorous pigs per litter. They have better dispositions and stay productive for more parities. As a matter of fact, an Iowa State University test showed that Chester sows had a 12% higher conception rate than three other breeds tested and ranked first in number of pigs farrowed, weaned and marketed per sow. The Chester White breed is virtually free of the stress gene. A paper given at an Iowa State Industry Center seminar showed Chester Whites were 1 of 3 breeds that consistently showed superior meat and eating quality. When crossed with other breeds a high level of heterosis is a typical response.